When writing anything about the Seasons, one inevitably encounters the work of Giuseppe Arcimboldo (1527-2593) and his allegorical cycles. Giuseppe Arcimboldo fits the definition of Mannerism quite wonderfully when one understands the term generally used to describe the painters who fall between the High Renaissance and the Baroque, that is, the period between the death of Raphael (1520) to the advent of the Baroque with the Caravaggio cycle on St. Matthew of 1599-1600 (Church of San Luigi dei Francese, Rome). Mannerism is characterized by highly intellectual or literary content and complex compositions in contrast to the classical stability to be found in the works of Raphael, and the more dramatic and populist approach ushered in by Caravaggio. 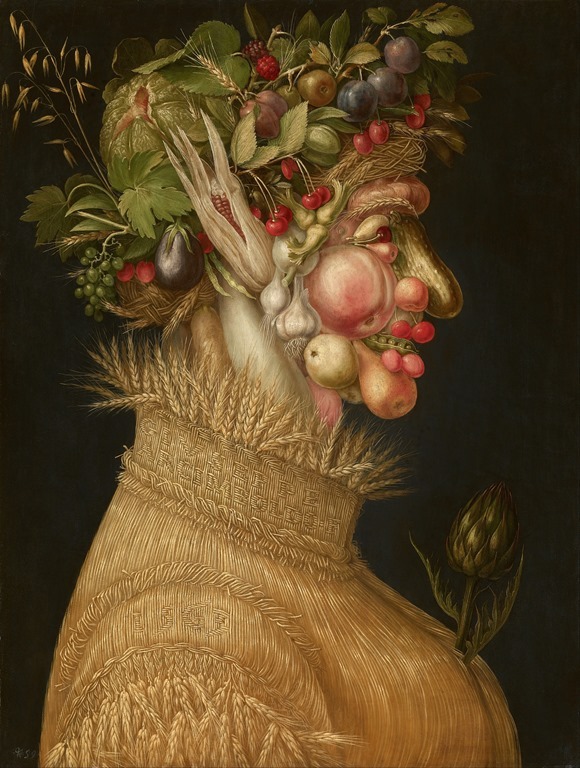 Arcimboldo is one of the more interesting of the Mannerist painters and his work is a curious blend of Italian sophistication and a rather painterly technique within a realistic or mimetic approach, mimesis being the art of imitation of reality or nature. He spent most of his life in Northern Italy, Vienna and Prague where he was patronized by three Holy Roman Emperors in succession, namely Ferdinand I, Maximilian II and Rudolf II. 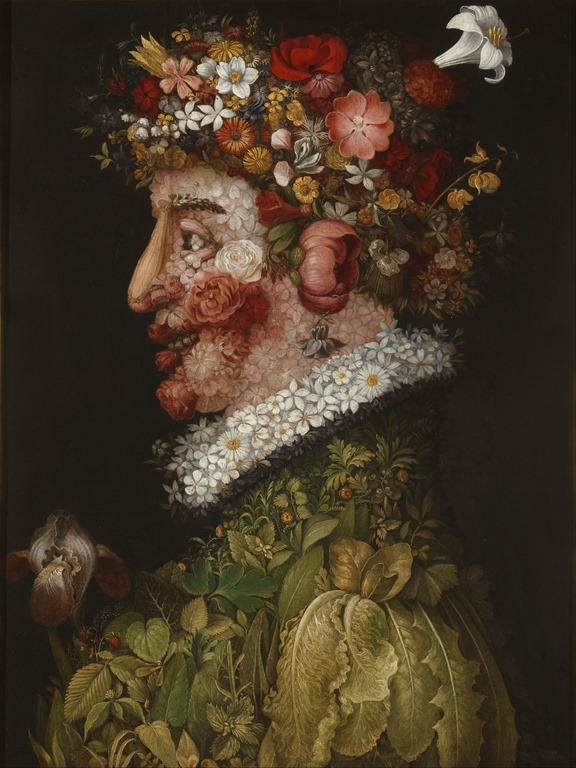 It was for Ferdinand I that Arcimboldo first conceived his first cycle of the Four Seasons in about 1563-66. The popularity of these works led Arcimboldo to repeat the cycles a number of times, with minor variations. Some of the individual works are lost, but one can nevertheless form a good idea of the allegories involved. Giuseppe Arcimboldo, La Primavera, 1563, oil on canvas, 66 x 50 cm, Real Academia de Bellas Artes de San Fernando, Madrid. La Primavera (Spring) sets out the manner in which Arcimboldo will paint his Seasons. Here all the flowers and foliage of spring are used in the format of a formal royal portrait, complete with ruffled collar and crown. But there is more to it than that. Cycles of the Seasons are often allegorical references to the Four Ages of Man, namely Childhood (Spring), Adolescence (Summer), Adulthood (Autumn) and Old Age (Winter). An interesting little book on Archimboldo by Liana De Girolami Cheney suggests further allegories and associations. 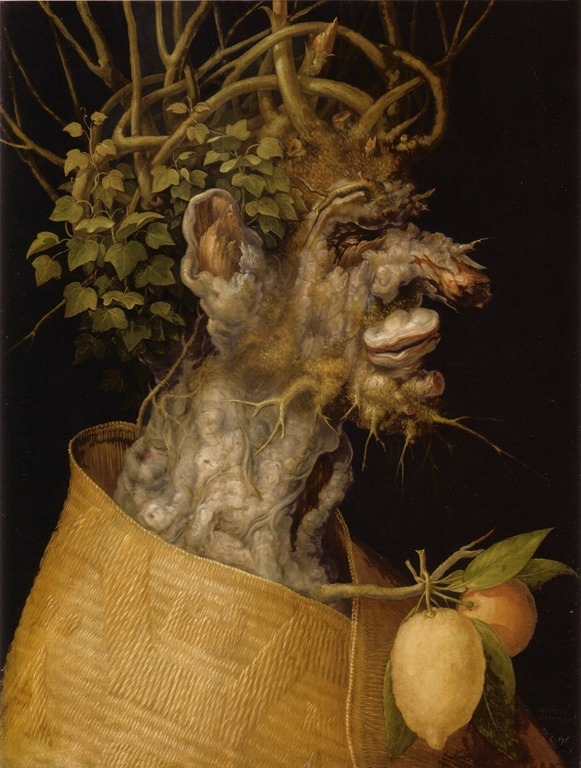 (1) She notes that Arcimboldo usually accompanied a Seasons cycle with another depicting the Four Elements, Air (Spring), Fire (Summer), Earth (Autumn) and Water (Winter), and that the cycles were meant to be seen and considered together. Mannerist paintings have complicated allegories and were intended for literate patrons who were familiar with the myths of antiquity, and various classical and symbolic allusions. For instance, as Cheney writes, “Spring and Air are both warm and damp,” while Summer is hot and dry, as is Fire. Autumn and Earth are cold and dry, while Winter is cold and damp, like Water. We would not necessarily make such associations today. 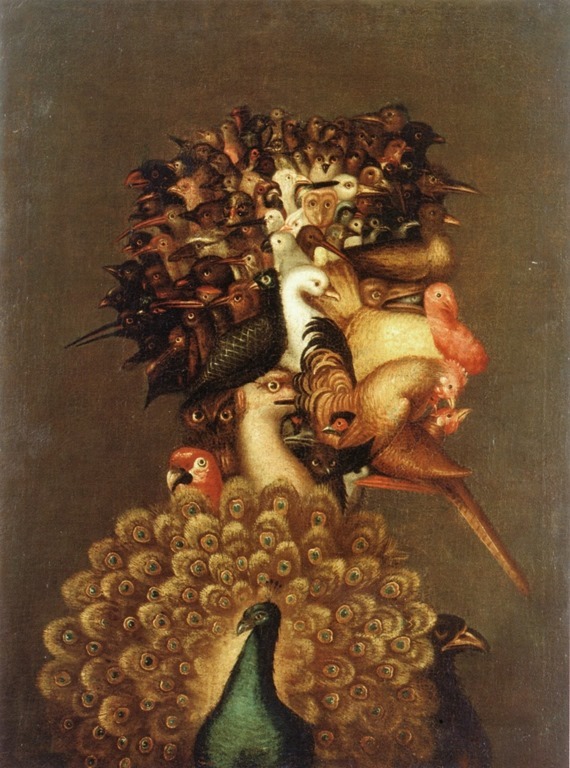 Giuseppe Arcimboldo, Air, ca. 1566, oil on canvas, 74.4 x 56.6 cm, Private Collection, Basel. The depiction of Air, therefore, concentrates on various birds “and their ability to fly without being hindered by atmospheric conditions” while Spring represents “the beginning of knowledge, the rebirth of new flowers, plants and vegetation.” Complementing Spring and Air results in a dialogue between the two works. Next come Summer and Fire. Giuseppe Arcimboldo, Summer, 1563, oil on panel, 67 x 50.8 cm, Kunsthistorishes Museum, Vienna. 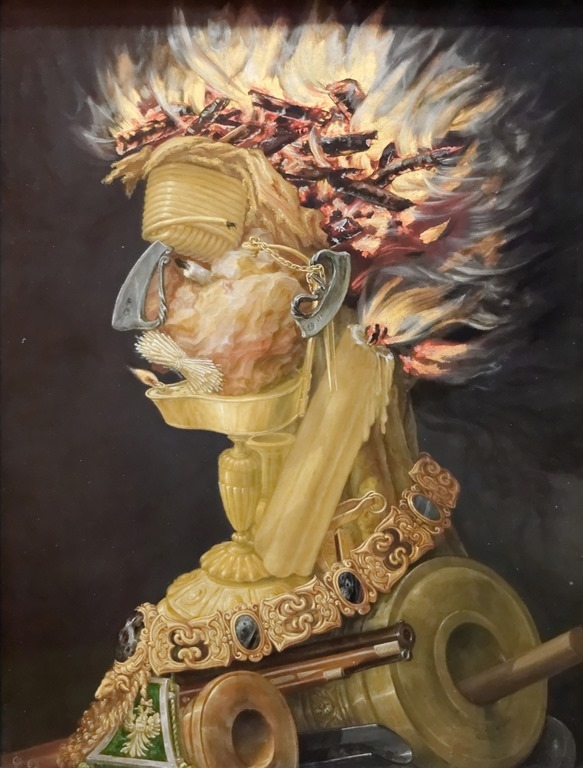 Giuseppe Arcimboldo, Fire, 1566, oil on panel, 66.5 x 51 cm, Kunsthistorisches Museum, Vienna. Summer includes a variety of fruits and vegetables associated with the season, while Fire assembles various objects associated with the element. Burning wood, candles, wicks, lamps as well as guns and canons clearly allude also to warfare. The collar is the Order of the Golden Fleece, an exalted Holy Roman Empire honour, itself forged in fire. Autumn and Earth are next in the cycles. Giuseppe Arcimboldo, Autumn, 1573, oil on canvas, 77 x 63 cm, Musée du Louvre, Paris. 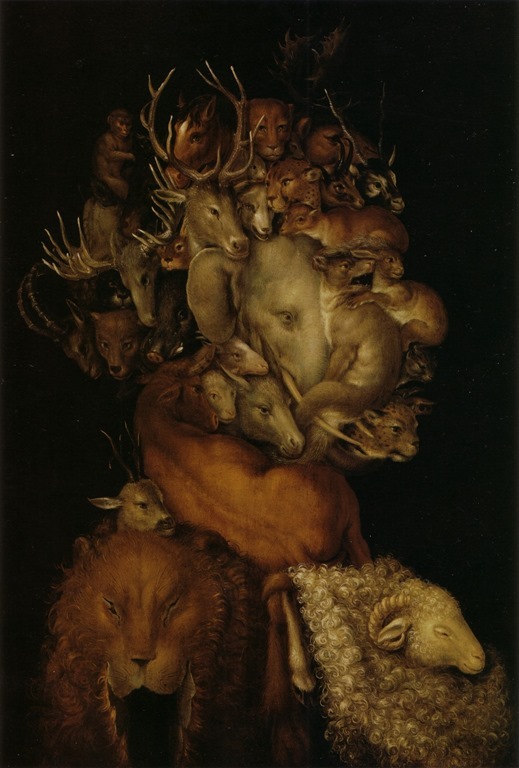 Giuseppe Arcimboldo, Earth, ca. 1570, oil on panel, 70.2 x 48.7 cm, Private Collection, Vienna. Autumn was often associated with the harvest, as well as the hunt, and it is this association which are immediately apparent in these two works. A splendid decorative border surrounds this version of Autumn in the Louvre. Various grapes, squashes and root vegetables are featured, and the torso consists of staves for a wine barrel. As for Earth, all kinds of animals are represented, and the chest consists of a sheep skin, once again a reference to the Golden Fleece. Giuseppe Arcimboldo, Winter, 1563, oil on panel, 66.6 x 50.5 cm, Kunsthistorishes Museum, Vienna. 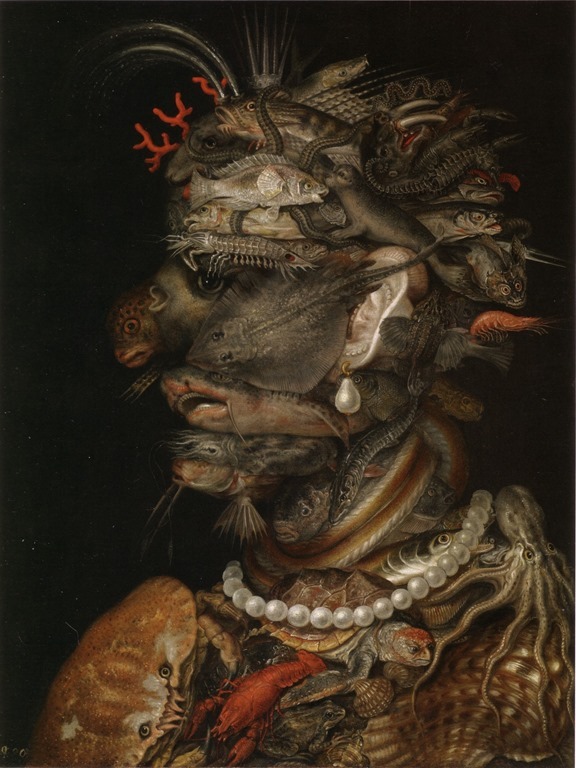 Giuseppe Arcimboldo, Water, 1566, oil on panel, 66.5 x 50.5 cm, Kunsthistorishes Museum, Vienna. The composition for the season of winter is not made up of various elements, but of an old tree trunk, clearly indicating the allegory for old age. The tree is without leaves but the ivy makes up the hair. Some kind of tree fungus seems to form the mouth. Citrus fruit symbolize winter. As for Water, various fish and shellfish are used for the portrait. 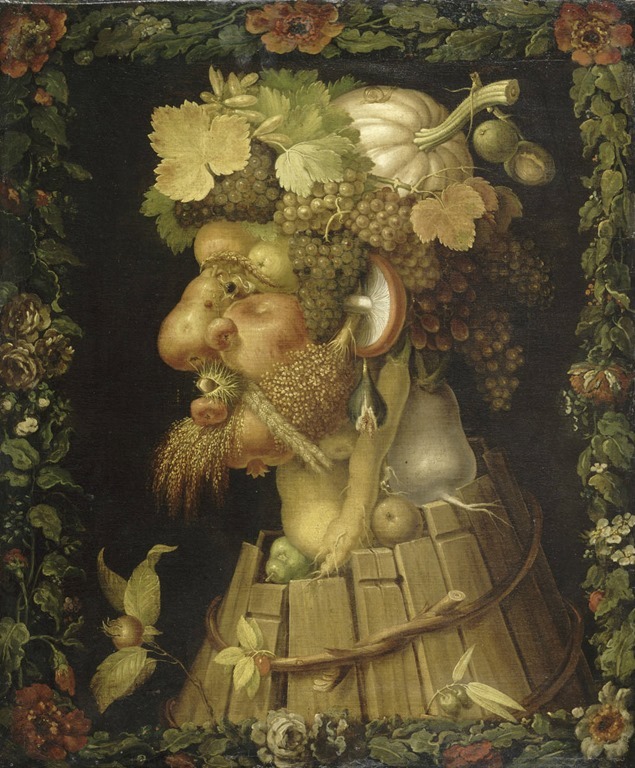 A website devoted to the works of Arcimboldo contains many of these works in various versions. There is even a version of the four seasons depicted as four reclining figures, in private collections, in landscape format. Each painting also includes a seasonal landscape in the background. But Cheney’s book does not even mention these intriguing works, and I could find no information on their provenance either. I will discuss Arcimboldo’s work again, as there are other works that I would like to present here, as they relate to art and food. Works reproduced are in the public domain, and online publication is covered by Wikimedia Commons licenses.